On May 26, 2015 my life changed. And while I’m still working on living out the change, I experienced a glorious paradigm shift that helped me rediscover the freedom of risk, failure, and adventure. And I want to keep the experience closer to the front of my mind for 2016, so I am writing out the story. I took a seven day white water rafting trip down the Grand Canyon – traveling a total of 188 miles over the week. The trip was organized by the Colorado School of Mines Alumni Association, and was hosted by Hatch River Expeditions. Confession: I am not a huge fan of water. I still cannot pinpoint why I thought that a rafting trip down the Grand Canyon would be the best use of my adventure time, but it does explain the anxiety knots in my stomach the evening before launch. Choosing to spend a (hefty) chunk of change on a trip during which I was going to be constantly wet, worried about drowning, and wasn’t going to be able to take a real shower suddenly seemed daunting, and no fun at all. And the first few days, I was more or less right. It was rainy and cold. I tried to grin and bear it, but grins become harder after two days of teeth chattering from being drenched from above and below by 50 degree water. I stayed huddled up in my rain gear, repeating a mental list about why the trip had been a huge mistake and a waste of my time. I suppose being alone on the trip did not help. But something changed for me on the third day. 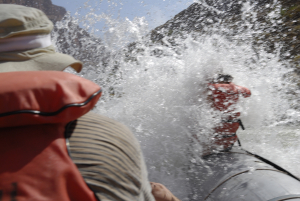 We started going through more intense rapids, and given my frame of mind, that was not a good thing because it meant two steps backward in staying dry (sequential rapids have a shampoo-instruction like quality – lather, rinse, repeat, with an emphasis on rinse). But the rapids also meant that the "other" side of the boat became more attractive for the adventurers on our trip. The boats we lived on had the unique feature of a relatively stable, stationary middle buoyed by two attachments tethered with ropes and carabiners that riders could straddle – like an eight second ride in water. I had not ridden on the sides nor the front of the boat until the third day. I had stayed safely, albeit a little miserably, on the stationary side of the boat. But someone vacated the front as we approached a larger rapid and some canyon wind ignited a dying ember of adventure and propelled me to sit in the front. To say I had a blast is an understatement – there really is no way for me to describe the fun I had. I hooted and hollered like I was on a roller coaster. I was still freezing, but it was thrilling. Before we made it to the next rapid, I had switched places with someone on the side part of the boat and had my first 15 second ride. I gripped the ropes tightly, clenched my legs around the sides and felt a surge of adrenaline as we tackled the next set of rapids. After a few rapids on the other side of the boat, I started smiling easier, laughing more fully, and felt warmer from the inside out. I suddenly realized that the trip was going to be a whole lot more fun on the other side of the boat. The side where I let go of my inhibitions and worry about being cold and wet, and instead held onto the ropes for dear life while hanging off the side of the boat. I experimented with swimming in the river more, I took hikes I would have been too afraid of before, I watched with wonder as stars filled up the night sky and didn’t care about whether I had a full eight hours of sleep. I found that the more I adventured on the rapids, the more immune I became to the cold, to the feeling of being alone, to the fear of what might be around the next bend. In short, I lived. I lived more fully in those seven days than I had in over four years. All because I learned in a brief moment that there really are two ways to ride this trip we call life: safely, quietly on the stationary side of the boat, or leaning into the rapids and riding them for all they were worth. I had the chance to feel the choice, the consequences of riding either way. And while sometimes I still struggle to live more of my day on the other side of the boat, I am grateful to know the difference – the first step to life abundant.